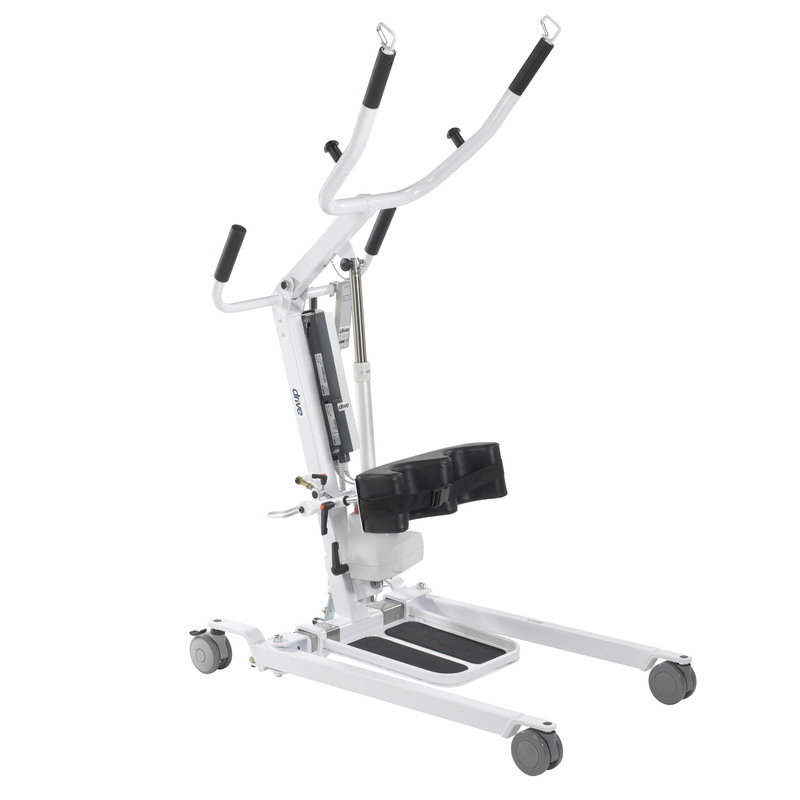 This stand-assist lift by Drive Medical provides patients with safe stable assistance while standing transferring or toileting. A extra-wide non-skid foot plate forms a stable base for foot positioning and a soft padded adjustable leg support includes a support strap to secure legs. The lift includes a convenient four sling attachment points that enable the lift to accommodate a variety of stand-up sling designs. Its 24 V DC motor is powerful and reliable featuring an emergency stop button and manual lowering device. The motor includes a removable rechargeable battery that charges quickly to eliminate down time. The battery complete with a charge meter will alert you both when charging is complete or when it may be necessary (below 50%) with an audible tone. Even transportation is simplified with easy-roll 4" casters that provide stability and easy maneuverability over a variety of surfaces. A 4.5" under-bed clearance allows the lift access under most long-term care beds. Unit includes: removable rechargeable battery (Model #13258); external charger (#13255) and wall-mounted bracket (#13260).